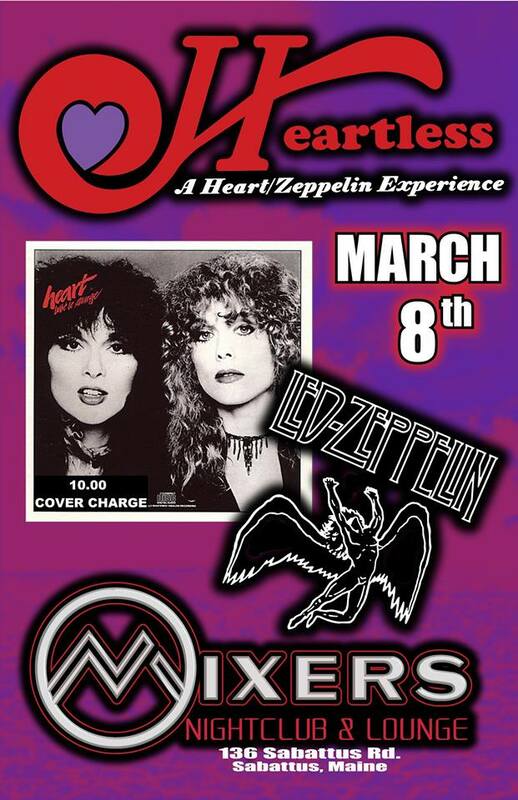 HEARTLESS is the Ultimate New England Heart and Led Zeppelin Experience which plays tribute to Ann Wilson of Heart! A touring act for the upper East Coast, and based out of Vermont with a goal of playing each song as true to live version of Heart’s performances. This band packs the house with each gig with fans who sing along with their classic Heart songs and Led Zeppelin covers commonly covered by Heart throughout their decades of tour. Jasmine White, lead vocal, brings all the vocal flavors and personality of Ann Wilson alive. Jasmine delivers songs such as “Alone”, “Barracuda”, and “Crazy on You” with ease while bringing the rough edges of her vocals to all the Led Zeppelin covers songs like “Whole Lotta Love”, “Black Dog”, and “Ramble On” as delivered by Ann Wilson on decades of tours. Complete in velvet coats and the signature hair, Jasmine provides an unforgettable and undeniable “Ann Wilson” performance.